Although it’s way late, today’s post was inspired by Randy Seaver’s Saturday Night Genealogy Fun – Who is Your Third Most Recent Unknown, as well as an email I received from a lady whose husband is also a descendant of Anna Maria and David. Rather than just a plain vanilla blog post, I decided to work this in to a project that I’m doing in my “other life” as a digital scrapbook designer. My latest venture there is into the world of Art Journaling – which I’m doing with a vintage/heritage flair. One of my 4th great-grandmothers was Anna Maria (nee Unknown) Reinert. She was the wife of David Rienert and mother of Elizabeth Reinert who married Matthias Levengood (my 3rd great-grandparents). Anna Maria was born circa 1765 and likely died prior to 1820. Her first name is known from her children’s baptismal records. David and Anna Maria lived in Colebrookedale, Berks County, Pennsylvania. David died between 10 Mar 1840 (when he wrote his will) and 13 Sep 1842 (when his will was proved). Early census data appears to indicate that Anna Maria died prior to 1820, and, indeed, David does not mention a widow in his 1840 will. So who were Anna Maria and David’s FANs (Family, Associates and Neighbors)? Well the census records for Colebrookedale in the early 1800s were (loosely) alphabetized, so we can’t say for sure who were their close neighbors without looking at land records. Most of David and Anna Maria’s children were baptised at New Hanover Lutheran Church. The surnames of Davidheiser and Gilbert appear most often as baptism sponsors. Among the Davidheiser sponsors were Henry and wife Catherinne in 1790 and again in 1794. Online trees show a Henry (1732-abt 1810) married to Anna Catherine (1735-1795). Tax records and early census records show a Henry Davidheiser living in Colebrookedale – presumably the same Henry Davidheiser that was married to Anna Catherine. Henry and Anna Catherine are known associates (through the baptismal records) and potential neighbors (per census and tax records). They are also of the age to be potential parents of Anna Maria. Unfortunately I cannot find a comprehensive list of their children. 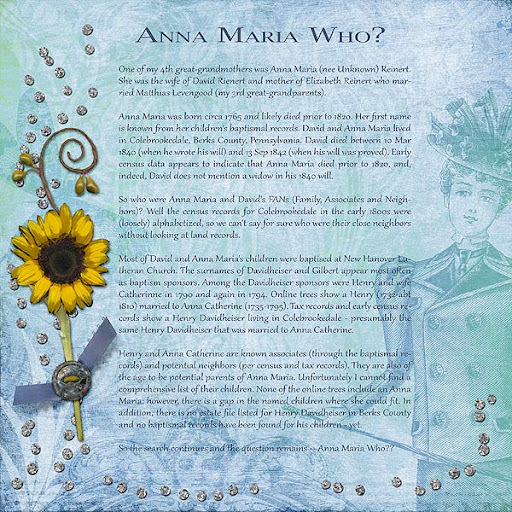 None of the online trees include an Anna Maria; however, there is a gap in the named children where she could fit. In addition, there is no estate file listed for Henry Davidheiser in Berks County and no baptismal records have been found for his children – yet. So the search continues and the question remains — Anna Maria Who?? As always, if you are related to Anna Maria and David Reinert or have any further information on this couple, I would love to hear from you! !